While investigating on the Candyman urban legend for a school project, a grad student accidently invokes Candyman, the hook-handed killer. 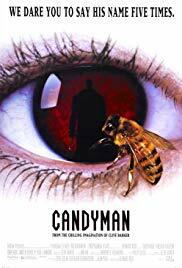 Based on the short story “The Forbidden” by Clive Barker, Candyman was a huge film when it came out in 1992. The story is still awesome, Barker and Rose managed to give rise to a very unusual villain. Son of a slave, with a hook instead of a hand, Candyman is a complex character which one could compare to Pinhead for his cold-blooded attitude, and to Hannibal Lecter for his eloquence. Add up to this the all story with the bees, and you get a rough idea how deep and fascinating this character is. Unfortunately, the film itself has grown old and modern viewers will probably get a little bored. Indeed, the action and horror scenes are scarce and the paste of the film is really slow. A classic though.